This contest is open to students and science teachers in Victorian schools. Entrants must submit their photos by email attachment. Check the AIP website, www.vicphysics.org/events/index.html for further details. This photo demonstrates two physics concepts: colour addition and light refraction. The set-up was as follows: a standard light box was placed on the bench, with red, green and blue filters over the three windows. A semicircular prism was placed in front, and the three beams of light were directed by their mirrors to shine into the flat side of the prism. As can be seen, the light beams are not affected by one another, and are refracted individually by the prism. Because the prism is curved, the pattern produced on the paper behind is curved. The three beams of light cross one another at several places, causing a colour addition in each of these regions. Where all three beams illuminate a region, it appears white. Where red and blue, it is magenta; where blue and green, it is cyan. Because of the design and arrangement of the beams, red and green are never together without the presence of blue, which would result in yellow. Areas not exposed to the light are black. Sydney Opera House – Reflection of light. The light reflecting off the tiles has actually been first reflected from the sky and clouds, with the size and shape of the reflection being proportional to the clouds above. This demonstrates specular reflection produced by the glossy tiles and it can even be seen on the other roof section farthest away. The tiles also exhibit diffuse reflection, where uneven grooves across it send the light waves in different directions due to the incidence/reflection relationship, giving a the image a distorted appearance. The degrees of reflectivity are noticeable with the effects produced from the contrasting tiles. The non-reflective tiles present a greatly more diffuse surface, where the reflection gives a much more uniform colour across the tile and the light seemingly spreads evenly, not producing an actual clear image. The resonant colour of a greyish blue is a resulting mixture between the blue light from the sky, the colour of the tiles themselves and the angle that the shot is taken at. When looking across a reflective surface, there comes a point when the angle is acute enough so that the reflecting image is seen more than the surface itself. An example of this may be when looking directly perpendicular to a clear piece of glass and seeing through it, then tilting the glass to an acute angle and seeing a resounding reflection off it from the surroundings rather than actually seeing through the glass. Ideally lenses, such as those in eyeglasses, should be clean and smooth in order to allow an unimpeded view of the world. With wear, glasses typically pick up small scuffs and scratches, leading to diminished clarity. This photo shows one reason for this. 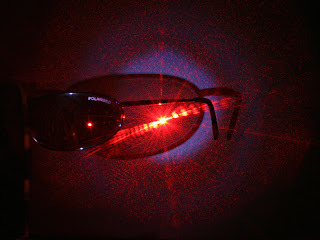 A monochromatic red laser at 633nm produces a coherent light beam, which can be seen here as the bright central spot on the relatively unscathed sunglass lens. With a pristine lens the beam essentially passes straight through and appears as a red spot on the screen the same size as the spot observed on the lens. However, in this case it hits a small scratch on the lens surface, resulting in a characteristic diffraction pattern on the screen, with a maximally bright central fringe where the single spot would otherwise appear, and spreading alternating dark and bright fringes resulting from destructive and constructive interference of the light waves. Random scratches on the lens surface are not as precise as the slits used to produce diffraction patterns in ideal physics laboratory situations, thus the pattern is not as pure as those produced by standard demonstrations. In this ‘real world’ example we see other less prominent diffraction patterns, and also tiny red speckles all over the screen caused by scattering of the laser light. An eye viewing the world through this lens would have a less than perfect view due to the combined effects of this scratch and many other small imperfections on the lens. 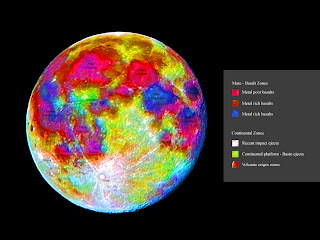 The images shows the moon in its full vibrancy of colours – a coloured geological map of the lunar surface. The photo was taken with the colours exaggerated to enhance the difference in tone. Different rocks reflect light in distinct ways, the colour of the reflection is a good indication for the type of mineralogy on the surface of the moon. The two main types of landscape on the moon, maria and highlands, are obviously different geological makeup – the maria are often blue or red tinted, depending on the metal content of the surface; the highlands are bright white, cause by the ejecta material sprayed on the surface. The best example of highland features is the Tycho crater, whose ejecta rays are spread half way across the moon. The image was taken during full moon as that is when all the lunar surface facing Earth is lit, allowing a complete mapping of the geology. The image was taken with a Canon Powershot, through the eyepiece of an 8inch f8 reflector. 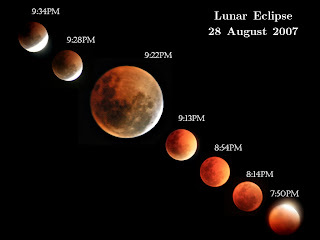 A total lunar eclipse took place on 28 August 07, and was visible from Melbourne, Australia. The photos show a time-lapsed sequence of the eclipse through its totality. A lunar eclipse occurs when the Earth is placed directly between the Sun and the Moon, casting a shadow that blocks the full moon. An eclipse consists of two elements, totality and partial eclipse – during partial eclipse only part of the umbra contacts the lunar surface, and thus only half the moon is lit; during totality the entire moon is covered by the umbra of Earth’s shadow. The orange-red appearance of which is caused by refraction of light from the atmosphere of the Earth. The dust from the atmosphere refracts white light into different colours – the spectrum; as red light bends the most, it is refracted onto the surface of the moon during totality, the dustier the atmosphere, the redder the moon. The images were taken with a Canon 400D SLR at f/200mm, the shots differ in exposure length as, during totality, the moon is much darker and thus needs a longer exposure to capture the vibrancy of the colour. The photos were then collaged onto one image portraying the different stages of totality, from which one can observe the umbra moving across the lunar surface, where the last few shots show the end of totality with a part of the moon lit in sunlight. Comet C/2006 P1 McNaught , the Great Comet of 2007, was discovered by Robert McNaught as part the Siding Springs Survey in Australia. The comet brightened in late January and was visible for a prolonged period of time in the Southern Hemisphere; soon it was named the brightest comet for 42 years (since Ikeya Seki 1965). The image shows a series of photos of the comet over a period of four days, presenting the declining brightness and tail length as the Comet McNaught receded from the Earth. The tail of a comet is produced when material ejected from the nucleus is carried away from the comet by the solar wind, the apparent length of which is dependent on the comet’s distance from the Sun and the observer (Earth). Visible also from the photographs is the anti-tail streaming from the coma – a small extension of the tail towards the right of the images. The comet declined in brightness dramatically over the period of 4 days, with an estimated brightness of -2 on Jan 22 and 0 on Jan 25. 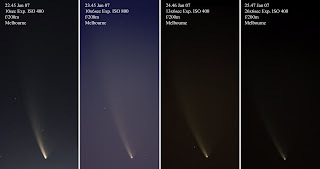 The photos were taken with a Canon 400D SLR camera at f/200mm, each consists a stack of several raw photos to increase the signal-noise ratio, thus the visibility of the tail section of the comet. At Burwood (VIC), where the photos were taken, the light pollution was severe, thus extremely long exposure shots were not possible and the graceful tail seen in professional shots was not captured. In the process of fusing hydrogen atoms into helium, the Sun releases vast amounts of very high energy particles (mainly protons) into space. Fortunately the Earth’s magnetic field is able to deflect this lethal solar wind or life on the planet wouldn’t exist. As the particles approach Earth they begin to spiral towards the poles along the Earth’s magnetic field lines. In this process they lose much of their energy, and when they reach the atmosphere they are energized to levels between 1 and 15 keV. In the atmosphere they collide with atoms of gases (typically atomic oxygen), causing the atoms to become excited. Soon after the excited atoms fluoresce, releasing the energy they gained as light and returning to their ground state. The light of the aurora in this image is mainly red, indicating it originated from fluorescing oxygen. At lower energy levels and higher altitudes oxygen fluoresces at a wavelength of approximately 630nm which is in the red area of the visible spectrum. At higher energies oxygen fluoresces in the green area of the spectrum (~558nm); and it is in this colour that the famous Southern Lights of Antarctica are seen in. This image was taken at Swifts Creek in Victoria which at a latitude of 37° 15’S is significantly north of the Southern Pole; resulting in the lower energy levels of the particles.